Large-scale catastrophic events that have global consequences, such as the Fukushima Daiichi Nuclear Reactor Explosion of March 11, 2011, demand an equally large-scale global response in seeking explanations of what factors contributed to this event and how risk from such sociotechnical, ecological, physical, economic interactions can be avoided in the future. Such a catastrophic event demonstrates vividly the degree of uncertainty and lack of knowledge that characterize the design and implementation of advanced sociotechnical systems such as nuclear power plants in physical systems subject to seismic risk that interact with economic and social systems of communities and neighborhoods. Only by mobilizing a systematic inquiry into the interactions among these different systems, each of which is only partially understood, will it be possible to achieve reasonable confidence in the human capacity to define, design, test, implement, and evaluate the responsible use of nuclear power in environments exposed to multiple and interacting risks. The Fukushima nuclear explosion created a challenge not only for Japan, but for the entire global community that is seeking sustainable energy to drive economic, social and political development to support the humane advancement of its peoples. Consequently, as the risk of nuclear contamination is shared with the global community, so is the responsibility for managing this risk, and importantly in defining, designing, and implementing a systematic inquiry into the potential costs and benefits of nuclear power as a sustainable source of energy in a continually changing world. Valid metrics for achieving an effective balance of risk and resilience have, to date, eluded policy makers and disaster managers in recurring efforts to reduce risk and nurture resilience in communities exposed to known hazards. Defining such metrics is a critical first step in initiating a systematic inquiry into the potential risks and benefits of nuclear power. The Fukushima crisis can be characterized as a ‘complex adaptive system of systems’ (CASoS) that demonstrates the emergence of a network of responding organizations in place of the pre-designed structure that failed to function. Systematically identifying the participants in the actual network, as well as the gaps in performance, offers a beginning step toward understanding the complex interactions among physical, technical, organizational, and economic systems that led to the crisis. These findings may, in turn, indicate potential options for redesigning a more sustainable approach to energy provision, not only for Japan, but also other nations seeking energy sufficiency. To facilitate such an inquiry, we propose creating a knowledge commons supported by advances in information technology that enhance learning not only at the individual level, but also at organizational and system levels through interactive search, exchange and collaborative updating of outdated or inaccurate information. Response systems that emerge following natural and human-made disasters consist of multiple systems that operate interdependently. Extreme events trigger escalating impacts to interacting technical, organizational, and socioeconomic systems that generate further dysfunction in the wider society. Understanding a large-scale, socio-technical-economic-organizational metasystem in sufficient detail to design informed action to reduce risk is a primary challenge for practicing managers and researchers alike. Robert Glass and his colleagues at Sandia National Laboratories have developed an analytical approach to address such interlocking problems. Termed a “complex adaptive system of systems (CASoS)” (Glass et al., 2011), this approach focuses on the critical role of interactions among participating actors and agents in defining new patterns of organization and practice. The CASoS approach has been applied in disciplines of physics, biology, mathematics, computer science, economics, and engineering. The basic premise is that entities form sub-systems by interacting with one another, and these sub-systems, in turn, interact with other sub-systems and their environments. Capturing the direction and rate of change within a complex adaptive system of systems, first among single entities, second among systems and their environment, and third among systems of systems, is central to understanding the evolution of change in complex, dynamic environments. The underlying assumption of the CASoS framework is that people learn, organizations learn, and systems of organizations learn to adapt their behavior to reduce risk, if investment is made in a socio-technical-cultural infrastructure to facilitate access to timely, valid information regarding risk, and accurate feedback regarding consequences of actions taken. In a crisis situation, no single organization can manage the entire response operation alone. Actors necessarily must work together to achieve the shared goal of timely, effective response. Three streams of literature stress the critical need for collective action, especially in events as severe as the Fukushima crisis. The classic concept of limited cognitive capacity (Miller, 1967; Simon, 1997) acknowledges that human problem solving capacity is limited to a small number of pieces of information that can be held in short term memory. This limited capacity drops still further under stress. Consequently, no single individual has the capacity to manage the complex set of interacting conditions that characterize extreme events in practice. To hold any single individual responsible for errors of judgment in managing extreme events fails to recognize the complexity of the process or to acknowledge the actual demands placed on decision makers in rapidly evolving events. Hutchins (1995) argues that ‘distributed cognition’ characterizes decision making in complex, dynamic contexts. That is, the skills needed to make decisions regarding complex operations that cross disciplinary, organizational, and jurisdictional boundaries. Consequently, decision making is a group process among knowledgeable individuals who have different skills, use different instruments to collect valid data, bring different backgrounds and experience relevant to the problem, but who trust one another to share information, correct errors, and develop a workable strategy of action. Key participants share in forming the basic knowledge on which decisions for the group are based. In this process, communication is key, as any member of the group has the responsibility to correct errors observed in the actions of any other member. Weick (1995) observed the cognitive process of ‘sense-making’ and developed the concept further in Weick and Sutcliffe (2007; 2001). This process relates to distributed cognition in decision processes in actual events. Weick defines it as the capacity to recognize anomalies in any situation that might indicate changes in underlying conditions or potential danger to the community at risk. It is this capacity to note variations in performance and to question why those variations are occurring that leads decision makers to explore alternative explanations for changing conditions. Moving this process to an interorganizational level in complex adaptive systems is a major task. Common to all three concepts is recognition that learning as an inherent component of organizational performance. Accepting this premise, a key component in coping with extreme events is the capacity to recognize change in operating conditions, adapt to that change with the most appropriate actions and resources available, communicate that change to others to form a common response, and correct errors stemming from outdated information or inaccurate assumptions. According to the Act on Special Measures Concerning Nuclear Emergency Preparedness (enacted on December 17, 1999), once a nuclear emergency occurs, the Japanese national government, local governments, and nuclear operators are to establish individual headquarters, and to communicate closely with one another as the situation develops. In addition to headquarters of relevant actors, an “off-site center” is to be established near the nuclear facility at risk to facilitate efficient communication, exchange developing information, and support decision making to ensure the safety and security of the population. 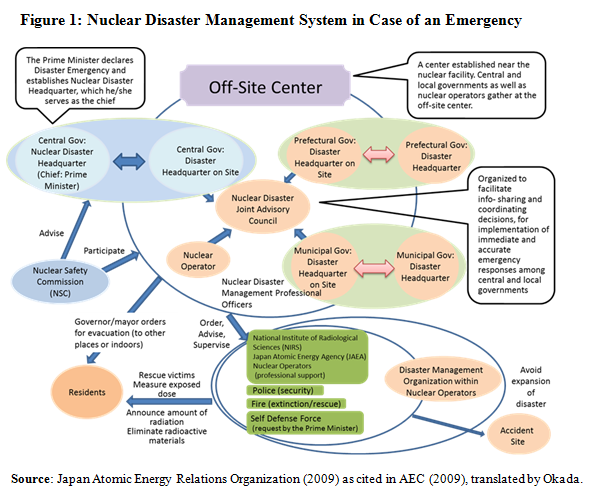 Figure 1 above summarizes the formal nuclear disaster management system in Japan, which ostensibly governed the Fukushima crisis. As stated in Article 27, Clause 2 of the Act, the mayor or governor of the threatened municipality is responsible for issuing alerts and/or orders for evacuation or sheltering in place. When the disaster struck at Fukushima Daiichi in March 2011, this pre-established structure did not function. The facility designated to be the “off-site center” in case of an emergency at the Fukushima Daiichi Nuclear Power Plant, located in Okuma Town, was heavily damaged by the earthquake and tsunami. The back-up plan was to establish the “off-site center” in the municipal building of Soma city, but this facility was also damaged. Thus decision-makers organized the center in the Fukushima Prefectural Government building, where no monitoring or communication systems were installed (RJIF, 2012, p.146). Second, technical systems intended to communicate with local municipalities were lost from the earthquake and tsunami. From interviews with local officials, Doi (2012) found that only Futaba town had a functioning telephone. In the remaining affected municipalities – Namie Town, Okuma Town, Naraha Town, Tomioka Town, Kawauchi Village, Hirono Town, and Kuzuo Village – landline and satellite telephones, facsimiles, and hotlines were cut off. What emerged in place of this pre-designed, but non-functioning structure was a network of organizations that recognized the severity of the danger and the need for collective action. Given available data, capturing such a network is difficult. We documented the emergent network by identifying engaged organizations and their interactions/communications from a content analysis of newspaper articles. 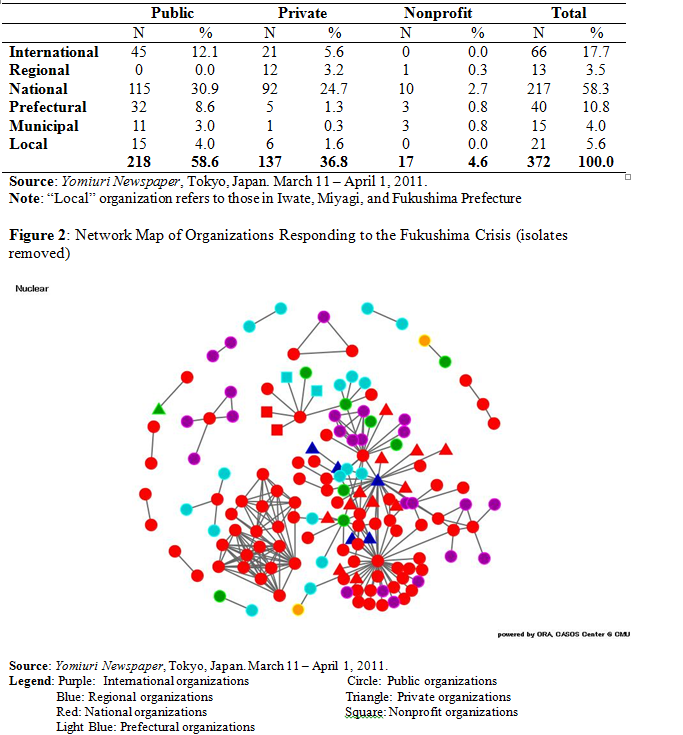 Table 1 and Figure 2 present the organizational network constructed from an analysis of Yomiuri Newspaper articles on the Fukushima crisis between March 11 and April 1, 2011. Identified were 372 organizations that participated in response to the Fukushima Crisis (for complete list of organizations, see Appendix). Table 1 shows that over half were public organizations, followed by private organizations, and nonprofits. Of the total number of organizations, 58.3 percent operated at the national level, followed by international organizations and prefectural organizations. Figure 2 above presents a visual representation of the responding network created with a network analysis software ORA. Sources of funding are presented by the shape of the node, and jurisdictions by node colors. The overall degree centralization for the nuclear network in Japan was 9.39%, which tells us that majority of the organizations were not in communication with another organization. In fact, 221 out of 372 organizations did not have any interaction with other organizations, and were isolated from the central network. In this map constructed from newspaper articles, we capture only four municipalities that were directly affected by the Fukushima Crisis: Futaba Town, Okuma Town, Iidate Village, and Minami-Soma City, and Okuma Town. Among them, only Futaba and Okuma Town had communicated with the central government, and Iidate Village communicated with another municipality in Kanto Area for evacuating the residents. Multiple reports in fact confirm that most of the local municipalities did not have official communication from the central or prefectural government; rather, they learned about the need to alert the residents for evacuation through television news (Doi, 2012; Fukunaga, 2011). Lacking communication channels, the mayors of the affected municipalities relied on their social networks to determine when to inform residents of evacuation orders, as well as where and how to evacuate (Doi (2012). Individual mayors communicated with one another, some reaching out to old friends as was the case with Futaba Town. Residents were informed of decisions made by their leadership via community wireless systems (bousai musen). When “black swan” events happen (Taleb, 2007), it is easy to blame the unsuccessful formation of a structure that was supposed to take place. More productive is an examination of the network of organizations that emerged to replace this failing structure and an exploration of ways to utilize these networks to their maximum capability. In preparing for rare and extreme events like the Fukushima Crisis, policy makers who focus on how to facilitate information exchange and communication among organizations so that timely, accurate information reaches local municipalities are more effective in organizing collective action. Building on these observations, we propose designing an interactive forum in which information search, exchange, and updating of obsolete information can occur easily and on a continuing basis. The concept of a knowledge commons (Ostrom, 2005; Hess and Ostrom, 2006) represents such a forum to inform decision making in changing conditions. In Ostrom’s terms, knowledge is a resource that, if shared, enhances the capacity of its users to learn and make informed, timely decisions in evolving environments. If framed in terms of the public good, a knowledge commons enables multiple groups and organizations to adapt their actions more efficiently to demands from the environment and to adjust their respective actions to one another appropriately as they seek a common goal, sustainability of their community over time. Knowledge commons are systemic in character, and performance depends heavily on the initial conditions of the local context and the design of the functions, structures, and processes that drive the system, as well as the local and global sources of knowledge accessible to the participants. Integration of these distinct components into a complex, adaptive system to support active feedback on performance and iterative information exchange is critical to the inter-organizational learning essential to managing continuous change (Nobre et al., 2009). The task of creating a knowledge commons for risk triggered by nuclear threat would likely enhance the ability of members of the community to exercise leadership in their particular tasks, should an extreme event occur. Informed and guided by participation in a knowledge commons, organizations responding to the disaster will act responsibly to protect the community, reinforcing and updating their actions based on new information and guided by an open, transparent process of public review. For the Fukushima crisis, the concept of a knowledge commons is particularly useful as situations continue to develop today. Recent news reported the loss of the cooling system due to a power outage (March 18, 2013) and a leak of radioactive materials from storage tanks (April 13, 2013). As of April 12, 2013, 96,264 residents are still forced to live away from their homes in Fukushima Prefecture (Reconstruction Agency, 2013). These escalating situations require engaged actors to work together and to inform the residents of the most up-to-date information. The key in dealing with the Fukushima Crisis, we argue, is in learning, communication, and information flow through creation of knowledge commons supported by information technology. Doi, Taeko. 2012. Evacuation Information and Behaviors on Fukushima Nuclear Power Accident (In Japanese). Environment and Environmental Pollution (Kankyo to Kogai), Vol. 42(1), pp.34-40. Fukunaga, Hidehiko. 2011. Nuclear Disaster and Evacuation Information/Media: Examining the Case of Fukushima Daiichi Nuclear Power Plant Accident. Broadcasting Research and Survey (Hoso Kenkyu to Chosa) September, 2011 Volume, pp.2-17. Hess, C. and Ostrom, E. 2007. Understanding Knowledge as a Commons: From Theory to Practice. Cambridge, MA: MIT Press. Japan Atomic Energy Commission (AEC) (ed.). 2009. White Paper on Nuclear Power 2009 Edition (in Japanese). Tokyo: Energy Forum. Miller, GA 1967. The Psychology of Communications. New York: Basic Books. Nobre, FS., AM. Tobias, and DS Walker. 2009. The Impact of Cognitive Machines on Complex Decisions and Organizational Change. AI and Society, Vol.24(4), pp.365-381. Rebuild Japan Initiative Foundation. 2012. Independent Investigating Committee for Fukushima Nuclear Accident Research Report (in Japanese). Tokyo: Discover 21. Simon, HA. 1997. Administrative Behavior: A Study of Decision-Making Processes in Administrative Organizations 4th ed. New York: Free Press. Taleb, NN. 2007. The Black Swan: The Impact of the Highly Improbable. New York: Random House. Weick, KE. 1995. Sensemaking in Organizations, Thousand Oaks, CA: Sage Publications. Weick, KE. and K. Sutcliffe. 2001. Managing the unexpected : assuring high performance in an age of complexity. San Francisco: Jossey Bass. Weick, KE. and K. Sutcliffe. 2007. Managing the Unexpected: Resilient Performance in an Age of Uncertainty . San Francisco: John Wiley & Sons. Yomiuri Shimbun. 2011. News Report on the Tohoku Triple Disasters, March 11 to April 1, 2011. Louise K. Comfort is professor of public and urban affairs and director, Center for Disaster Management, Graduate School of Public and International Affairs, University of Pittsburgh. Her research focuses on decision making under conditions of uncertainty, information processes, and sociotechnical systems. Aya Okada is assistant professor in Faculty of Policy Studies, Doshisha University, Kyoto, Japan. Her research focuses on the design, implementation, and evaluation of communication processes used by nonprofit organizations as they seek to sustain their voluntary support in societies undergoing economic, social, and political change. This paper and the one posted by Shineha and Tanaka share an interest in developing a larger scale understanding of post-disaster response dynamics. Here the focus is the population of organizational actors that emerged in response to 3.11 and the structure of the resulting network(s). These broader data collection efforts are very much appreciated and in somewhat short supply in STS, which is heavily dominated by historical and ethnographic case studies. They also help us understand what Disaster STS can offer more traditional disaster studies – in this case, a deeper and more theoretically complex appreciation for the dynamics of knowledge production and circulation than is rendered in the concept of a “knowledge commons” as presented in the paper. This is great material for workshop discussion. A question about data: I understand that the organizations were identified through content analysis of newspaper articles, but I don’t understand where information on network ties comes from. Newspaper articles won’t provide that – or at least we can’t rely on newspaper articles for complete data on network ties. Did you interview people from the organizations to get this information? Did I miss something? This paper was fascinating! Like Scott, I wanted to hear more about how newspaper articles provided information on dyads and information nodes within the network of “responders.” Further, I wanted to hear more about the definition of responders – did any organization, whether NGO or local government, which sought to do something qualify? For example, sending in supplies? Organizing patient evacuation? Searching for survivors post-tsunami? Posting information online? Given the fascinating arguments about the lack of connections between the organizations, I wanted to hear more. Thanks for this great essay! I was wondering if you thought if creating a knowledge commons implies a centralized repository of knowledge on the web that can be used by different groups. In India, there has been a big push by local anti-nuclear protests against creating such a forum, because local NGOs and institutions say they have a better understanding of local context, and are content with their own local, informal, knowledge commons. The problem of language, where different Indian states speak different languages compounds the problem of trying to create such a forum to deal with existing crises and future ones. Yet I see a desire to understand what is going on in different states, and so groups will send representatives to other sites of protest, and places where small nuclear accidents have happened to learn from them. Similarly, many groups cite data and reports from nations like the US and France to improve their understanding of the dangers of nuclear energy. So in this sense, I think there is ambivalence in wanting to create a centralized system, yet at desire to build, based on local capacity, exactly the kind of complex adaptive system you describe. A great paper–thank you for your contribution. I was piqued by the introduction; on the one hand, there is a deeply democratic impulse at work in what you write, and I would not argue against gathering more information, widening the types of data that “count” in these discussions, and then making it widely available. But I do wonder about the philosophical counterpoint that might argue that disasters such as these are always escaping or exceeding our ability to manage them. In other words, how do we create a viable knowledge commons that empowers/gives agency/enables management, while at the same time understanding that the risks of highly coupled, complex technological systems may always exceed our ability to measure or quantify them? I’m thinking in particular of William Kinsella’s work. And also: how to prevent the commons from being co-opted or pre-empted by risk managers who might bring a more technocratic approach to information gathering? I enjoyed this paper, which clearly has some resonance with Sonja Schmid’s paper as well. I am sympathetic to the effort here: the idea to use knowledge to improve disaster response. As I read the paper, two STS points stuck in my mind that could merit further discussion. First, given all that we know from STS scholarship about the contingency, messiness, and local character of all knowledge, can a “knowledge commons” accurately capture this complexity? Or does it risk reducing a broad array of understandings to a single set of narratives? Second, I am curious to know more about the connections between knowledge and power. Even if residents of Futaba and Okuma knew everything about what was going at the power plants, this does not mean they had the power to change it. They still bore the brunt of the harms through radiation leakages, property damage, etc. Are there mechanisms by which a knowledge commons can be about more than simply sharing information? Fascinating to see the scope of organizations included in this study: it is impressive that you have been able to map the organizational response so specifically. It would be interesting to include more culturally specific variables to see if there are certain features of Japanese bureaucracies that mitigate against information flow, and to examine how this was embodied in a particular (that is, focussed) case study, such as the SPEEDI controversy. This system of radiation assessment had been in place since 1993 and although apparently a few billion yen went into developing the system, the information was not conveyed to the appropriate authorities at the most crucial time. This is a more narrowly constrained compendium of information than a more inclusive knowledge commons but it may be comparable in that it was well established, tied into a matrix of organizations, and designed to be communicated to various authorities, and yet it was not acted upon by the authorities who were directly responsible for its implementation. If knowledge sharing would not work in this instance, would it be feasible in a more inclusive knowledge commons that transcends multiple organizations, with all the corresponding linkages and complications that entails? I wonder if the Kobe earthquake might serve as a useful basis of comparison, given the magnitude of that event? And, after Kobe, why all the lessons learned and disaster drills and crisis management protocols were not utilized effectively? I’m reminded of recent pension and police scandals in Japan, where it was learned that some of these administrative offices are not even computerized (as recently as 2007, it was revealed that some 50 million Japanese pension payers could not be matched with citizens on the rolls). If these administrative offices remain woefully out of date, would it be possible to communicate a common base of knowledge in an interactive process that requires technological proficiency and a common will with similar goals across multiple organisations? This kind of effort is certainly important, but as suggested by one or two other comments, I am concerned about provision for local (sub-prefectural inputs; prefectures are the lowest level mentioned here, and my research in other areas suggests that prefectural level administrations can not by any means be presumed to be knowledgeable about more local affairs) inputs. Add to this my concern about the ability of central/urban – oriented bureaucrats and scholars to “hear” and “read” information from rural and small communities, and we have a good recipe for the errors Scott noted in _Seeing Like a State_. Although it may be in the back of the authors’ minds, explicit discussion of resilience of this system — dispersed and duplicate operations centers, information storage, provisions for emergency power back-up — should be discussed explicitly. Thanks for developing this programmatic statement about a resource that would surely add value. I agree that this paper resonates quite nicely with Sonja’s and others. It’s not fully clear to me how affected communities would access the system under real-time disaster conditions: broken communication infrastructure, lack of clarity regarding what’s actually happening leading to lack of clarity regarding what questions to ask the system, and such. But presumably, part of the task of creating the knowledge commons would be to address these issues. But another way the commons could be useful is as a repository of information on past disasters–lessons learned, case studies, templates for action, and other resources for disaster planning and preparation. Jen raises the question of situations that exceed our ability to predict, control, and understand them, what I call the “limits of representation.” My own work has looked at these limits more in the domain of preventing rather than responding to disasters; that is, risk analysis and risk communication rather than disaster response and crisis communication. But it does seem to me that a repository of knowledge could be valuable in both contexts. Like others who have commented, I would be interested in hearing more about the variety of forms that an interactive knowledge commons could take in the context of disaster response. Crowdsourced disaster information sites, live blogs, etc., could probably also count as part of the knowledge commons in this sense, so perhaps it’s not a case of either/or when it comes to centralization or localization. My colleagues who are working on the crowdsourced disaster website concept worry about verification a lot: how to build verification into those systems so the systems don’t end up amplifying outdated or erroneous or even deliberately malicious info in a situation where split-second decisions can have huge consequences for survival. This is thought-provoking material, and I look forward to discussing what shape a knowledge commons would take. I remember in political science there are studies of “veto players” or nodes in political processes where actors could more easily stall an initiative. I’m wondering if in thinking about the set-up to deal with the nuclear crisis that you point out in the first section, if you found such bottle-necks, and how these could be avoided or improved in designing a knowledge commons. This would touch maybe of Kath’s comments about the reliability of crowd-sourced information, and if in making sure that it is reliable, there is a risk of creating such bottlenecks. Very interesting research! And “CASoS” approach seems to be useful to understand the dynamics between institutions and actors related to the 3.11. And concerning Figure.2, if we can see time-lined change of network structures of related organizations, it will be more insightful material to discuss dynamics among organizations and between each level systems. Is there any plans for further analysis targeting after April 2nd 2011? As I am providing commentary on this paper at the workshop I have held back from commenting in this forum–and I see the group has already done my work for me! Very provocative paper. Thanks to the authors for asserting that knowledge, effectively collected and channeled, and openly available, might still hold out the best possible way forward to provide reasonable safety in risk society. This view itself will drive a spirited conversation. The theoretical dimensions (and certainly the practical dimensions) of a knowledge commons will also be discussed, I’m certain. I hope the authors might come ready with one or two examples of how a knowledge commons (or something approaching it) has worked in previous disasters.